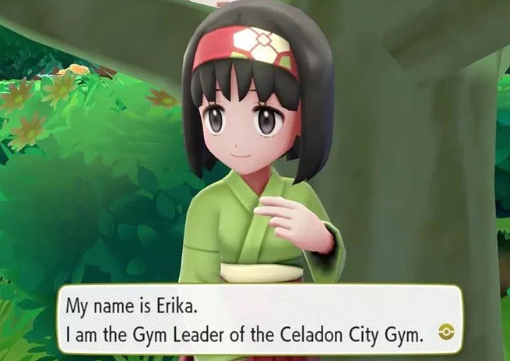 Believe it or not, the Celadon City Gym should be yet another easy win for your trainer. At least, it should be this way if you make smart captures and decisions on your way to it. All the trainers in the Celadon City Gym use Grass Type Pokemon, and these type of Pokemon are extremely weak both to Flying Types and Fire Types. Pidgey, a Flying Type Pokemon, is one of the most common Pokemon in all of the Kanto Region, and odds are you will have caught and trained at least one before coming to the Celadon City Gym. On top of this, you can obtain a Charmander as gift from a trainer back on Route 24 simply by having caught at least fifty Pokemon. With both Charmander and Pidgey (or their evolutions), the trainers within the Celadon City Gym will be no match for you.